...... The auto split feature can be used to break the recording up into multiple files. The scheduled recording feature allows you to have an unattended scheduled recording. You don't even have to have the program running. It will start automatically for the recording. It can also open a live Internet audio stream like an Internet radio station so it can record it. Equalizer, notch, high pass, and low pass filters can be applied to the recording. Includes 12 built in skins to customize the appearance of the program. Help you to record sound from your computer and text. 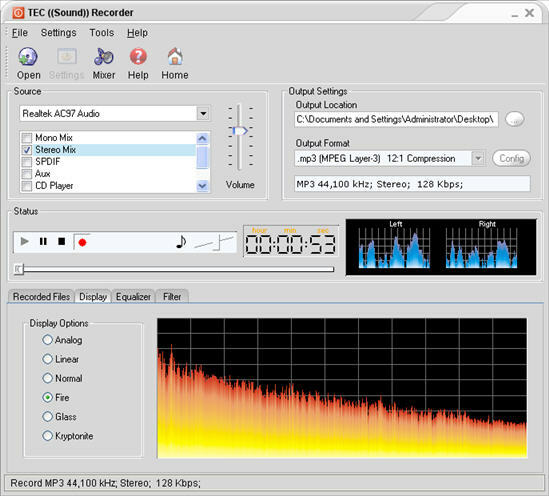 Qweas is providing links to TEC Sound Recorder 1.0 as a courtesy, and makes no representations regarding TEC Sound Recorder or any other applications or any information related thereto. Any questions, complaints or claims regarding this application TEC Sound Recorder 1.0 must be directed to the appropriate software vendor. You may click the publisher link of TEC Sound Recorder on the top of this page to get more details about the vendor.